Beers There are 6 products to choose from. Takeaway Lanzarote - Restaurants Puerto del Carmen Heineken Bottle 33cl. Add drinks to your order ! 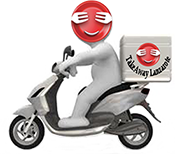 Takeaway Lanzarote -Delivery Service - 24 hours !Order high-quality takeaway online from top restaurants in Puerto del Carmen, fast delivery straight to your home or office .Get amazing food from an incredible selection of local restaurants . Takeaway Lanzarote - Restaurants Puerto del Carmen Dorada Bottle 33cl Takeaway Food & Drinks - Puerto del Carmen, Lanzarote : Calero | Costa Teguise | Arrecife | Playa Honda | San Bartolome | Haria | Macher | Femes . Order food and drinks ! Home delivery service 24 hours / 7 days a week. Pizzas | Kebab | Indian Food | Chinese Food | Italian Pasta | Spanish and Canarian Food | Greek Food | Portuguese Food . Takeaway Lanzarote - Restaurants Puerto del Carmen Tropical Bottle 33cl. Takeaway Food & Drinks - Puerto del Carmen, LanzaroteTakeaway Lanzarote, takeaways online, food delivery with over 100 restaurant menus offering Pizza, Kebabs, Chinese, Indian,Thai, Italian, Canaries, Spanish, Mexican, French . Takeaway Lanzarote - Restaurants Puerto del Carmen Coronita Bottle 33cl. Takeaway Food & Drinks - Puerto del Carmen, LanzaroteTakeaway Lanzarote, takeaways online, food delivery with over 100 restaurant menus offering Pizza, Kebabs, Chinese, Indian,Thai, Italian, Canaries, Spanish, Mexican, French . Takeaway Lanzarote - Restaurants Puerto del Carmen Strongow Bottle 33cl. Takeaway Food & Drinks - Puerto del Carmen, LanzaroteTakeaway Lanzarote, takeaways online, food delivery with over 100 restaurant menus offering Pizza, Kebabs, Chinese, Indian,Thai, Italian, Canaries, Spanish, Mexican, French .